Looking for a Used Wrangler Unlimited in your area? CarGurus has 88,950 nationwide Wrangler Unlimited listings starting at $4,550. 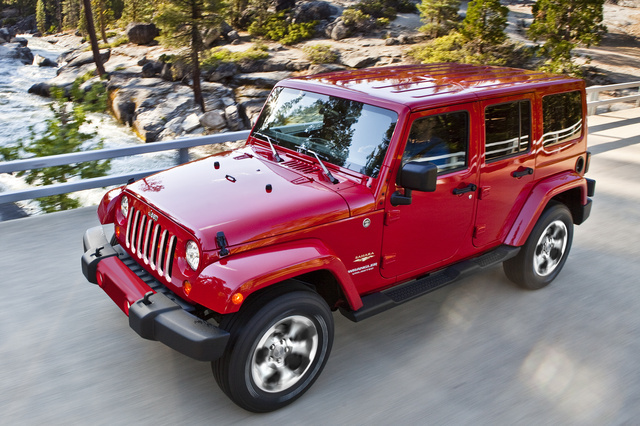 For the 2004 model year, the Jeep Wrangler became available as a 4-door for the first time. Some purists initially scoffed at the long-wheelbase Wrangler, but the buying public appreciated the extra interior space and easier access to the rear seats, and the Wrangler Unlimited has been a strong seller ever since. But while it might be roomier than the standard Wrangler, the Wrangler Unlimited is not without many of the usual compromises. It doesn’t have a good ride, is fairly slow, and in general has sub-par build quality; but these shortcomings are gladly accepted by most Wrangler buyers, who are more interested in open-air motoring and taking things off road. The next-generation Wrangler may come as soon as 2018, but changes for 2017 include available LED headlights and fog lights as well as a new Sport S trim and a Cold Weather package. Available trims are the same as for the 2-door Wrangler, but prices for the 4-door Unlimited are notably higher, with a range-topping Rubicon starting at a serious $45,428. Under the hood for the 2017 Jeep Wrangler Unlimited is a 3.6-liter V6 that makes 285 hp and 260 lb-ft of torque. This engine is coupled to either a 6-speed manual or a 5-speed automatic transmission that, while perfectly capable, dates all the way back to the Daimler-Chrysler days and is actually an old Mercedes-Benz unit. While nowhere near as painfully slow as some Wranglers of the past, the Wrangler Unlimited is still far from the fastest vehicle on the road, and at anything much greater than highway speeds, occupants will quickly learn that the Wrangler has the aerodynamic properties of a brick. These aerodynamics, combined with its significant mass, contribute to the Wrangler Unlimited’s less-than-stellar fuel economy, which is rated at 16 mpg city/21 highway/18 highway with the manual and 16/20/18 with the automatic. The Wrangler Unlimited really isn’t meant to go quickly anywhere, and that’s especially true in the corners. Relatively old-fashioned body-on-frame construction, solid axles front and back, and a serious height make a classic recipe for bad handling, and the circulating ball steering doesn’t have a particularly direct feel. This is a vehicle with serious off-roading chops, however, and those shortcomings on the street turn into strengths once the pavement runs out. Skid plates and an electronic sway-bar disconnect system add confidence off-road, and manual-equipped Wrangler Unlimiteds feature standard hill-start assist. Different trims also come with various axle ratios as well as available off-road or heavy-duty suspensions. Jeep has really stepped up its game on the inside of the Wrangler over the past couple of years. What used to feel basic and even cheap is now a pretty nice place to be, while still being utilitarian and easy to clean. The gauges and available chrome shift knob are particularly neat touches. The Wrangler Unlimited is 20.6 inches longer than the 2-door Wrangler and has correspondingly more room on the inside. That includes rear storage, which is fairly limited in the 2-door version. In the Wrangler Unlimited, there are 71.6 cubic feet of storage in back with the rear seats folded and 31.5 with the seats up, much better than the 2-door Wrangler’s 56.5 and 12.8 cubic feet, respectively. While a base Wrangler is a bit spartan, upper trims have a reasonable amount of interior features, including Bluetooth, USB ports, voice-recognition controls, satellite radio, auto-dimming mirrors, power outlets, premium audio, and heated front seats. One of the biggest appeals of a Wrangler isn’t what’s inside, though; it's the access to what’s outside. With removable doors, a removable top, and even a fold-down windshield, the Wrangler Unlimited gives occupants access to the world outside like few other vehicles on the road can. Soft tops are a bit tricky to deal with and hardtops are too heavy for one person to handle, and both let in a lot of wind noise even when they’re up. Rear visibility can also be an issue, but that can, of course, be solved by simply removing the top. The Wrangler is in general one of the least safe new cars on the road, although the 4-door version got slightly better results in Insurance Institute for Highway Safety crash testing. There also aren’t any of the high-tech safety features that many people have come to expect from all new cars. A high ride height, exacerbated by popular lift kids, means Wranglers are also easy to flip. But to be overly concerned about safety, fuel economy, or luxury is to completely miss the point of a vehicle like this. It’s about fun, and the Wrangler Unlimited delivers that while also offering a usable amount of extra room over the classic 2-door variant. What's your take on the 2017 Jeep Wrangler Unlimited? Have you driven a 2017 Jeep Wrangler Unlimited? What if we have it listed elsewhere it sales from there or locally? Do I still pay? Looking to buy a factory front bumper from a rubicon 2014. Will it fit my sahara unlimited 2017? How come some 2017 Jeep Wrangler Unlimited Sahara ‘s have navigation system and others don’t?